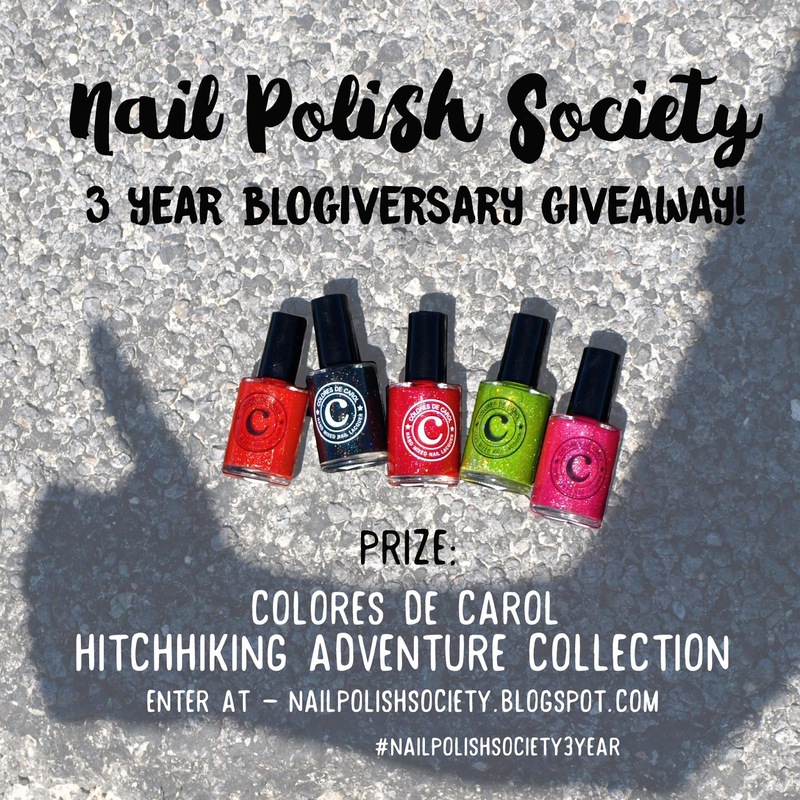 Nail Polish Society: Three Year Blogiversary + Colores de Carol Giveaway! Three Year Blogiversary + Colores de Carol Giveaway! Hello my wonderful Society Sisters! Yesterday was my three year blogiversary and I still can't believe it! Thank you to all my readers, followers, friends, and fans for supporting me throughout these past three years. I honestly wouldn't have made it this far without you! It's been an amazing journey so far and I can't wait to see where else it takes me. To celebrate this milestone I have a giveaway that Carolina of Colores de Carol has so generously provided. Enter in the giveaway widget below for your chance to win the five piece Hitchhiking Adventure collection (swatches in my previous post)! How to Enter: Earn entries through the Giveaway Tools widget. Both Visit Facebook entries are mandatory. Liking and commenting on Facebook is not required but of course always appreciated! For the Repost On Instagram entry, repost this photo and include the hashtag #nailpolishsociety3year. Make sure to have your account settings on public so I can verify. Selecting a Winner: On July 25 or shortly thereafter I will notify the winner (chosen by Giveaway Tools) via email. Please remember to add nailpolishsociety@gmail.com to your contacts so it doesn't get sent to your SPAM folder. The winner will have 48 hours to respond or a new winner will be chosen. I will announce the winner once they respond.